I forget that my tinnitus can play up a little after long journeys. It’s not so bad after a night’s rest but still a bit louder than normal (whatever normal means, it’s hardly normal having tinnitus), what with the airplane dehydration and travel noise. I can’t really complain at 8 hours from my front door to a hotel front door in Bavaria, you have to think of our not too distant ancestors where a journey like this would be in the degree of weeks at best. 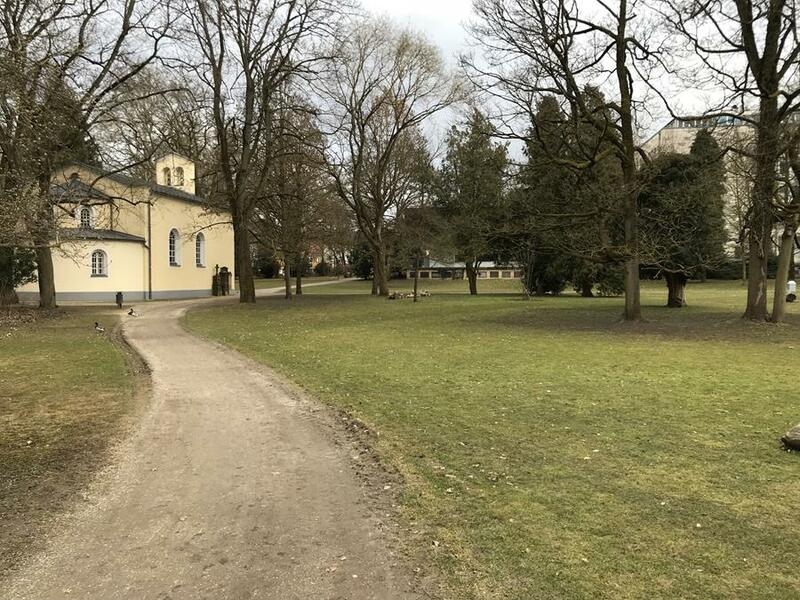 The setting of Regensburg is beautiful, such an amazing place to walk around and I got to walk through the park to the conference, the birdsong was most welcome to my tinnitus. Introductions came from the University and from Berthold and Winny of the Tinnitus Research Initiative. Tinnitus Talk were even mentioned in the introduction by Winny! The first of these meetings was 12 years ago. At that time they say there closer to 30 people, today there are 300 attending. They thanked Matteo De Nora for beginning the whole process with his financial support. Without his substantial contributions tinnitus research would not be where it is today. I can’t go into too much detail on all of the talks right now, so I’ll give general impressions of the day. This is purely for time and stomach related reasons, I’m typing before I go for dinner and I have to practise my talk ready for tomorrow. The first keynote from Tobias Kleinjung had the slightly controversial title “Can Cochlear Implants be a Cure for Tinnitus?”. The short answer is not really, unless you have a profound hearing loss, and then temporarily. The primary complaint for a CI is hearing loss, generally over 70dB. Tinnitus is the secondary. One interesting thing I took from this was that when you stimulate one side only with a CI, in single sided deafness, the “good” hearing ear can also experience a reduction of tinnitus. Suppression is only when using the CI, but it can sometimes last for a time after it is turned off, a kind of residual inhibition. They aren’t certain what the reason is behind this. It certainly wouldn’t be a recommended route for those with normal hearing, but if the mechanism is identified it could give data that would really interest me and could inform future treatments not based on CI. I sat in on the neuromodulation session next. A lot of very interesting presentations on modulating the brain. Richard Tyler presented on findings from MicroTransponder’s Serenity System, the implanted Vagus Nerve Stimulation device. I asked later about the sound stimulation they used, interestingly across the audio spectrum, rather than centred only around the tinnitus frequency. Although they have around an octave centred on the tinnitus pitch (as matched by a test) that has no sound played. There were several sessions on rTMS. I couldn’t do them justice without first understanding more about it as I’m not 100% familiar with the intricacies. It was very interesting to see that they have come from a position that it may not be viable, to one that it needs to be designed specifically around the patient. Future projects will look at the comparison between rTMS and direct electrical stimulation. The final session was on neurofeedback. Based on the findings that people with tinnitus have reduced alpha activity in the brain and an increase of Delta, they tried to influence the Alpha and Delta to separate. They use visual feedback for their tests; a UFO travelling along a tunnel, alpha brainwaves control the speed and Delta controls direction. The aim is to balance things for a smooth ride. There was no placebo group for the data presented, however they did find that an increase in Alpha activity in those with tinnitus corresponded to a decreased loudness of tinnitus and decrease of tinnitus distress. When they followed up at 3 months the loudness had returned to baseline. It’s a passive process, rather than training a person to focus on Alpha or Delta waves. They found that when the patient tried to focus on a particular brainwave pattern they struggled to control the UFO. At lunch I got talking to a couple of Doctors from Ireland. They don’t practice or research tinnitus, but they both have it and have a family history; they attend for the understanding of the current state of research. Really interesting to talk to them, patient to patient, about their impressions. Straight after lunch we went into the poster sessions. Lots of excellent posters, including the ESIT students. The data from our 2015 survey features in the poster and work of Jorge Simões. Excellent to see his development of it, looking at the treatment successes and relationships between them. In the centre of the room there was also a really cool iPad demonstration of our treatment data. An excellent student (apologies I forget the name) has created an interactive graphic showing all of the treatments we asked about. You can look at the relationships in several ways, but in essence you place your finger on a treatment name and it displays the connections to other treatments that helped or didn’t. I’m not describing too well, I got a brief video but tomorrow I will do a demo and post the video for you to see. I also got chatting to a couple of people interested in the next survey project we have for trying to profile tinnitus, then test how certain treatments work to see if we can predict success by understanding the case history. I hope we will get to work with them on the project, they want to do the same thing as I do so I think it may happen. The afternoon keynote came from Hubert Lim. He presented work in animals and non-invasive neuromodulation. The talk was around sound + body stimulation to treat tinnitus. He showed a series of brain scans from stimulation of the body, activating the inferior colliculus. The question was can you control plasticity effects in the auditory system with sound + body stimulation? The evidence certainly appears to support the theory. It was interesting to note that they gave stimulation to Guinea Pigs via the pinna. They would have used the tongue, but it was too hard because of trying to keep the stimulation device on the animals. Made me think, this seems a positive note for the approach that the Mute Button device has taken. The tinnitus CBT session was good. I know that there are people that aren’t a fan of CBT in general, but you just can’t deny that it is well researched and has a good success rate. It isn’t for everyone of course. The evidence presented adds to that knowledge. CBT from a recent Dutch study is now available as a treatment for tinnitus on the Dutch health care system. One of the talks in the session revolved around CBTi (CBT for insomnia). Looking at a stat of 50-70% of people with tinnitus reporting sleep disturbance it’s definitely something that can help a lot of people. Their initial work has shown good results, they have a Randomised Controlled Trial completing next year. In the coffee break I chatted to someone who has been data mining from the forum. Unfortunately his talk is in the opposite session to mine tomorrow, so I’m going to try and get a copy of the slides and put the information up on TT. I went to the session for the COMIT’ID project after. We are currently helping out the discussions by hosting a private forum for participants to debate and agree certain aspects of the outcome domains. We split into groups and debated one of the definitions. It was a very useful session and one that gave me a few new perspectives. It also got quite a few people interested in taking part in the online discussions around the definitions. Shamefully I didn’t realise that there was still a final keynote, so I headed off. I was looking forward to it too. So, if Fatima Husain reads this – I’m sorry. I will try and catch up and get some info from her at some point if I can. The general impression is very good. I’ve met a lot of people and have seen the data we’ve collected here through Tinnitus Talk cropping in in several areas. To know that the work we have done is contributing to research is exciting. The information provided by all of the people that have taken part in our surveys is being put to very good use. There will be more, and we will make sure that the patient voice and patient data are getting out there. The first keynote of the day was from Christopher Cederroth. How much do the genes and the environment play a role in tinnitus? The data presented was from the Swedish registry of twins. 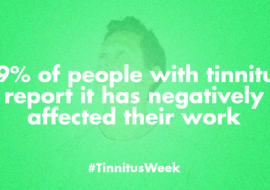 15% of people in the twin registry reported tinnitus. Tinnitus displayed a high level of heritability, 68% for men with bilateral tinnitus, 43% for any tinnitus, 41% for women with bilateral tinnitus and 27% for unilateral tinnitus. See this slide for a comparison to other diseases. An interesting thing that came from the work is that in the Swedish studies there is a strong link between smoking and tinnitus. This is not from the nicotine because they have compared it to oral tobacco. It could be an inflammation of the lungs that is involved here. The findings need to be replicated and expanded from other studies, to confirm it is a link rather than an unlinked finding. The study concluded that unilateral and bilateral tinnitus may be distinct genetic sub-types. Interactions between genes and environmental interactions may give insights into the mechanisms of tinnitus generation. He identified a need for a consortium where multiple tinnitus centres can collect DNA samples for future genetic analysis, as this work is done retrospectively from databases at present. Each centre would need to develop its own biobank. 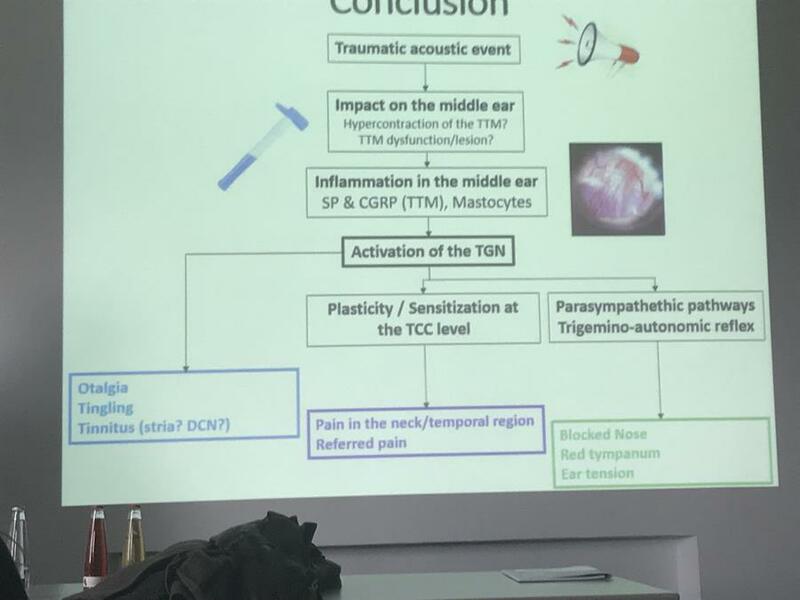 Further work on the genetic side of tinnitus is being carried on through one of the ESIT student Natalia. Lucy Handscomb presented on CBT for tinnitus distress. How do people relate to it and is it useful as a clinical tool? This is a really good piece of work, it evaluates the protocol implemented by Laurence McKenna. It’s a quest to understand how CBT is perceived and how they can improve upon the existing model. Everyone on the course reported having negative thoughts. Difficulty coping, worried it won’t go away. Tinnitus was generally seen as a barrier to positive emotions and pleasure. It was interesting to see that therapists thought the model was too difficult to understand but patients actually didn’t have a problem with it. Therapists misjudged patients, we speak the language and have a far deeper understanding. Not everyone got it, but this was echoed by Laurence (who was in the room). It does work for some people and for those that respond it works well. However, for some it just doesn’t resonate or doesn’t work. One of the quotes from a patient, which I know will be thought of others, was “that model doesn’t apply to everyone who has tinnitus”. Therapists and some patients disliked the suggestion in the therapy that people perceived tinnitus as louder than it really is. The lessons are being used to improve this particular CBT program. The next session was presented by Tien-Chen Liu. He presented on his theory of some tinnitus being a result of a cochlear migraine. I was looking forward to a further presentation on this in day 3 but I couldn’t make it due a coffee break meeting running over. Migraine prevalence is 13% of the general population. He highlighted a case of a patient who presented with aural fullness and migraines, who returned 5 years later with a hearing loss and tinnitus. Similar attacks, treated with migraine protocols. The tinnitus was unilateral, (right sided). These are preliminary results that require more investigation. However, he thinks that cochlear migraine can imitate things such as sudden deafness. A vestibular migraine model (which is closely associated to Meniere Disease) is behind the work. The preliminary clinical features of the proposed cochlear migraine are: Unilateral fluctuated hearing loss with tinnitus or aural fullness, no vertigo and no progressive hearing deterioration, migraine clinical features of family histories. The next presentation was by Myra Spiliopoulou. Mya and her team have been data crawling Tinnitus Talk for a while now, they have created a lexicon and used machine learning techniques. I am not technical enough to understand it but I can say that they won second paper award at ICBHI 2017. This is a very big achievement and shows the degree of technical genius that her team have displayed. I am going to source a link to the information display because it is excellent to see. I can’t do the work justice by describing it. They have summarised the activity on Tinnitus Talk and created a program to show how positive or negative a treatment is spoken about. It’s like a real-time barometer of treatment success. The final presentation of the session was from Nicolas Dauman. I had talked with Nicolas earlier in the conference about his ideas, he is interested in psychological approaches to tackle tinnitus frustration. His theory is that addressing frustration eases tinnitus annoyance. It is a patient centred approach, involving the patient in the therapeutic process. One thing that differs his model from most that I see is that it allows for relapse and gives the patient an understanding of this. I can picture this being more effective as there is no implicit idea of personal failure. There are four circuits within the model. He aims to empower patients through their insights on tinnitus variability. Their tolerance is a balance of the individual resources and environmental constraints. The second session I attended was looking at individual case studies in tinnitus. We spend a lot of time with large groups and statistics but often forget about how an individual case can be addressed. The first presentation was on using a combination of CBT and rTMS, for effective treatment of tinnitus and insomnia. In the case study the patient was not interested in psychological treatment so was started on rTMS as a more physical intervention. The rTMS acted as a gateway for the patient to try CBT as they were not interested in it previously. The message here was that a combination of treatments can work, rather than trying things successively. The treatment protocol must also be optimised for the patient. They will proceed to test this approach now in a larger sample. Next up was a student conducting her first presentation in English. The case study involved using auditory tests to identify that the patient had an issue. This lead the team to instruct an MRI and found a lesion in the brain. The test used was Auditory Invoked Potential. In a non-hospital environment, they felt it was an essential diagnostic tool. Arnaud Norena presented next on the putative involvement of the middle ear in tinnitus and hyperacusis. This was an especially interesting case study as the individual had been able to precisely record their symptoms. The subject became interested in tinnitus from a cluster of symptoms. It was initiated from a traumatic acoustic event. The case study provides information about this particular tinnitus type. Immediately after the event they had clicking in the ear, ear tension and ear fullness, but had a normal audiogram and other exams. The full range of symptoms pointed to an involvement of the middle ear (ear fullness, tension in the ear, fluttering ear, dull and / or stabling pain in the ear). A video was played that the subject had taken themselves, using a camera in their own ear. There were some incredible changes inside the ear during tension of the muscles / jaw. They had a low pitched tinnitus associated with a fluttering in the ear. This was worsened by inserting things in there such as earplugs. Stimulation of the middle ear can cause contraction of the tensor timpani. The blast could produce a hypertension, causing a lesion on the tensor tympani, which triggers inflammation in the middle ear. This can activate the trigeminal nerve and can cause the symptoms. A new sub-type could be Trigeminal Autonomic Cephalgia – Otalgia. The case study is extreme but less symptomatic cases could exist and be more prevalent. The next presentation was a case study form the Microtransponder trial. With one individual, there was a plateau at year 2. They tried continuous VNS as an experiment, rather than following the normal protocol, remove the tone part of the therapy. There was a dramatic decrease in tinnitus loudness reported after 2 days of continuous stimulation. Mild side effects only that were able to be instantly addressed. Effects seem to have deteriorated over a 10 month period, however they turned VNS off and within 2 days there was a rebound effect. Tinnitus came straight down on switching the device back on. Regardless of ups and downs the patient is doing better. Constant stimulation of the Vagus Nerve has been used in treatment of depression and epilepsy. In responders the effects increase and continue over time. They had wondered if this case study displayed a long term “habituation” to VNS, however the studies in other areas show this not to be the case. It may be treating depression but there may also be something else at play for further research. I had lunch with the same two Doctors from yesterday. Conversation included the taste and strength of the Bavarian beer and of course impressions of the conference so far – which were generally good. The keynote after lunch came from Sarah Michiels. We worked with Sarah on some of the questions for our physical links survey, so it was nice to see her using some of the information in her presentation. There were a couple of charts on global perceived effects from different treatments (specific to the complaint). TMJ perceived as 73% receiving benefit, 53% perceived benefit for neck treatment. Sarah showed a couple of videos of physical treatments from her clinic. I can’t fully describe them, but I would love to see broader research into these and some kind of guide produced that a competent physical therapist could use. Treatment techniques were shown to treat the cervical spine. Exercises were also shown to stabilise muscles of the cervical spine. 53% of patients had reduced tinnitus severity from this work – these were patients who had been identified as potential candidates to benefit from physical manipulations and exercising. Patients with low pitch tinnitus were found to be more likely to benefit from this type of intervention. Female patients were found to be far more likely to have somatosensory tinnitus. They have a higher chance of TMJ type disorders. They do see some patients with somatosensory tinnitus in their clinic who cannot modulate their tinnitus with movements. I found this interesting as I always associated it with certain movements. In general, I feel like Sarah is a lonely figure in the research into physical symptoms. We do report these as a group in quite high numbers, so I personally feel like we need to clone Sarah and learn a lot more about physical manipulations for somatosensory tinnitus. The first afternoon session was around new approaches to treating tinnitus. It started with a study on menopausal hormone replacement therapy for chronic tinnitus in a migraine patient. Experience was presented from 13 cases. Chronic tinnitus was present in 33% of menopausal patients. After treatment their THI scores dropped 61 to 14, a 77% reduction. The VAS dropped from 8 to 3. The investigators typically found that hearing also improved. Oestrogen may work on auditory function, it may also work in the brain on the vmPFC and may work on the Amygdala. The investigators thought that it may also work by helping depression. From a study that was referenced, it can be an influence in GABA and in sleep. The next talk was around the value of Eye Movement Desensitisation Reprocessing protocol in the treatment of tinnitus (EMDR). This treatment has been effective for chronic pain and phantom pain in recent studies. The group made the assumption it could also be useful for tinnitus. They tested two groups. TRT + CBT or TRT + EMDR. The protocol was developed for PTSD originally. EMDR involved bilateral stimulation, with an 8-phase protocol. This is all performed by a certified EMDR therapist. Preliminary results of 30 patients show improvements from treatment, with improvements also recorded at follow up. The study ends in June 2019. The last 2 presentations of the session were from Susan Shore’s students, on their somatosensory research. The presentations were on auditory somatosensory stimulation desynchronising the brain circuitry. Since tinnitus arises from hyperactive, hypersynchronous DCN (Dorsal Cochlear Nucleus), they aim to treat tinnitus by evoking STDP (Site Timing Dependent Plasticity). Repeatedly and persistently desynchronise the DCN circuit. The stimulation was not given in a fixed place, rather the electrodes are placed around the region that gives the greatest modulation to tinnitus, with the current also suited to the maximal sub contraction level. Bimodal, rather than unimodal stimulation reduced tinnitus and improved quality of life. The treatment effect seemed to accumulate over time. Positive data from their trial was presented. They presented the trial design (which I won’t print for obvious reasons), which was robust. 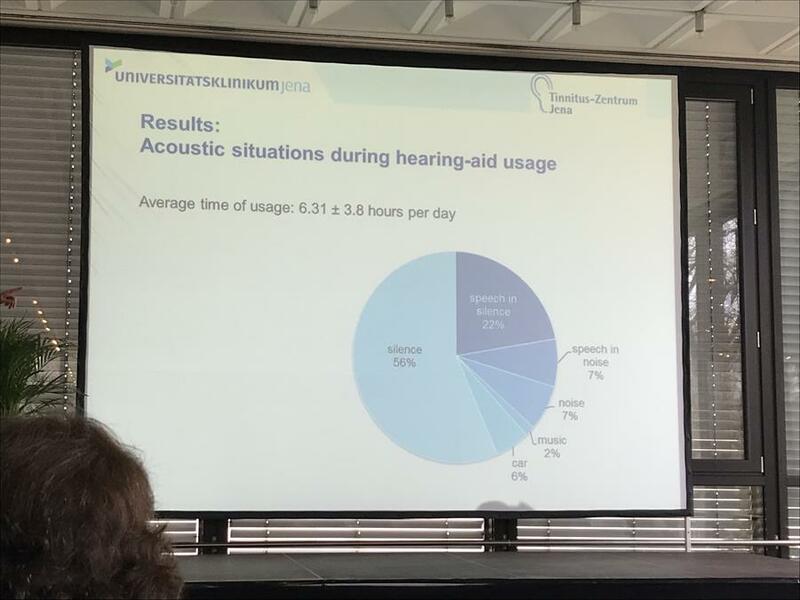 All subjects from the trial presented had clinically normal hearing (40dBa) and tinnitus for at least 6 months. The device logged compliance with the protocol, which was found to be near perfect. Sham groups had recorded no significant change. The active groups had significant lowering of tinnitus loudness when using the device. Improvements in loudness did not appear to last when not using the device. However, the TFI scores showed a lasting improvement. Their next steps are to test if it works for non-somatic tinnitus, and how does it work on hearing loss patients. The next questions are, will longer treatment durations improve outcomes, and how long does the treatment effect last? And of course, can they optimise the protocol further? This device and treatment approach are a big thing right now on the forum. I feel the attention is justified so I’m looking forward to the progression and to seeing results come out. The second afternoon session is one where I presented, so I have another choice made for me. I’m missing a talk in the parallel session using data from TT. However, I did get a chance to talk to Guillaume (who had crawled data from TT) and I will post something about his analysis soon. The first 2 talks were on the COMIT’ID project. We have covered this in a lot of detail with our posts and advertising of it, and are hosting the COMIT’ID online forum, so I will give a brief overview of the project. The idea is that in three distinct areas outcome domains (the things that should be measured in a trial for a tinnitus treatment) are standard for all research. The three areas are sound based treatments, psychology based treatments and drug based treatments. Currently it is near impossible to look at data from a trial and see how it compares to another trial. People seem to arbitrarily select from a long list of outcomes which they will measure. If the main outcomes are standard for all trials we will be able to see how one treatment measures up against another. When they began they found 172 things that were being measured. This was whittled down and through a long process of listening to all parties there are now a core set. The final stages are on the go right now, to make sure all of the definitions work. We are hosting the online space to facilitate these discussions. They asked groups from industry, research and patients to contribute to finding the most important things to measure. The involvement of the patient in deciding what outcome domains should be measured in tinnitus research was given a lot of importance. David Stockdale of the BTA presented the Tinnitus Cure Roadmap. The focus of the roadmap is the search for a cure. The core vision is a world where no one suffers from tinnitus. The roadmap is designed to show knowledge gaps for the industry to follow, to try and get research in these areas. There is going to be an online version produced, with a traffic light system to show if research needs to be conducted in a certain area or not. David is right in the explanation that some areas have an abundance of research that really doesn’t need adding to (CBT springs to mind), whereas some areas have little to no research and desperately need more understanding. One of the things that this work aims to do is to inform those that are investing in research that they should direct their funds into areas that need them the most. The challenge now is out to all parties in the research community. This is vital and important work, we need the search for a cure to be focused. 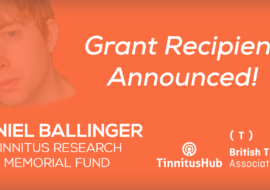 There are limited sources of funding for tinnitus research so we should make sure they reach the right places. Magda Serada gave the presentation before mine on research into combination hearing aids. These are aids with various programs for tinnitus relief. There was much variation in hearing aids, the fitting and calibration by the providers differed. This work will develop a standard fitting procedure for combination hearing aids. The clinicians will be guided to take a more patient centred approach. Patient opinion has been incorporated into the recommended procedure. The Delphi process was used (similar to the COMIT’ID process). Magda went through a lot of samples of the process to demonstrate how the patient views were placed at the core. Many patients in the study group didn’t get a tinnitus benefit, but they got a benefit to their hearing. My talk was an introduction to Tinnitus Talk. I went through the visitor numbers, the way we have things set up and how we want to develop deeper ties with research. I also covered the surveys we have run to date and the collaborations we have developed. We have actually been able to contribute quite a lot from patient opinion into the field of research. I always want more, so I invited people to come to us with projects and things that can have a real benefit to the patient community. I talked with quite a few people afterwards, with some projects that I think could be exciting. People were interested in the idea of profiling the tinnitus causes of a person and then seeing how they may respond to a treatment type (or not). I think we have done amazingly well for being a small team, but I know we can do even more. Unfortunately, I had so many post-talk chats that I missed Derek Hoare talking (sorry Derek). I did catch the very end, and his summary slide included something which I feel quite strongly about. Mixed methods of treatment, involving the patient, and triangulating the findings to learn more. It’s the conference dinner tonight, on a boat out on the River Danube. Dirk De Ridder gave a speech at the start. He said that he loved to see less grey hairs and more youth coming into the research field. He did also say that there was more innovating to be done and he hadn’t seen enough disruption. I like his attitude. I had quite a long chat with the Neuromod Devices team (MuteButton) late into the evening. I totally get where they are coming from and I can say that the general consensus of others I talked to was the same. They told me that they have taken a step back from the market to get the process right. The approach does have a lot of elements, not just a simple stimulate and tones playing. The device is actually very similar in description to Susan Shore’s (very similar, especially as they have Hubert Lim on their advisory board, who advocated the tongue rather than other body parts for stimulation). Final day of the conference and the end of a very enlightening trip. It’s worth acknowledging again that without the EU COST initiative none of this would have happened. And today feels especially good. The dinner last night was excellent. I wasn’t sure what to expect of dinner on a boat, but this was one very nice boat. I got talking to quite a few people during the trip. The first keynote of the day was titled “Not seen and not heard, chronic pain and tinnitus” from Johan Vlaeyan. Many reading this will know that links between chronic pain and tinnitus have been discussed before; do we use the same brain centres, are there similar processes at play? The costs of chronic pain are very high, people are not able to participate any more in everyday life. Figures of prevalence for chronic pain are very similar to those of tinnitus. Pain is a sensory and emotional experience. Even though there is no discernible reason behind the pain, it is considered pain when someone reports it as pain, an internal event that cannot be shared with other people. It is a homeostatic emotion, takes action – escape or avoid a situation. In this (very blurry) slide the original words that have been replaced in red are from descriptions of chronic pain. Pain sensations can be mediated by the perception and expectancy of harm; the more harm that is perceived, the more the patient suffers. Many studies show the perception of harm correlating with the degree of suffering. Paradoxical effects of avoidance. In tests where a person was exposed to pain with no potential for avoidance and another group were able to avoid the pain if they wanted to, they avoidance group displayed a lower threshold for pain. Having the possibility of avoiding pain lowers the tolerance to pain and increases the associated fear. As people we generalise. A stimulus that looks like another that causes pain can be interpreted as pain. The brain then starts to interpret things as harmful that had no pain association previously. Persistent avoidance behaviour in chronic pain creates a lower tolerance to pain and can lead to more suffering. This really felt true of tinnitus, as many of us can relate if we have been in a phase of over-protection. When you forget to protect, the outside stimulus can feel so much worse than you imagined. Johan emphasised that studies of individuals could be very useful in tinnitus. There is a quest for the RCT as the gold standard, but you can learn a lot from a deeper exploration of interesting cases. Chronic pain treatment involves goal setting. Showing the individual that they can do things, usually building up in small steps. There was a demonstration of some of the therapy via a video “John and his dogs”, challenging the perception of the patient and overcoming the fear associated with the chronic pain. To conclude, he said: Chronic pain and tinnitus are both examples of plasticity disorders, where the symptoms are caused by plastic changes that are not functional any more. Harm expectancies can be self fulfilling. Harm avoidance can be practical in the short term, but damaging in the long term. Exposure techniques may help tinnitus via “exposure violation”. First up was Richard Tyler, presenting some research he conducted on Tinnitus Activities Treatment (TAT – an unfortunate acronym ). Tinnitus Activities Treatment uses a broad range of techniques. There are several modules that patients can choose from, the idea being that it is tailored to their needs. This made a lot of sense to me, we need to be involved in the process because some things just do not fit for certain individuals. TAT protocols can be downloaded from University of Iowa website for free. They won’t necessarily help the individual, but I like the fact that any professional can access the protocols and try delivering them in their own clinical setting. The patient takes possession of the program, the first question of session one is “where do you want to start?” They used partial masking or full masking audio techniques based on the preference of the patient. Counselling was given in a group setting rather than one-on-one, so that people could relate to each others experiences and share with others that were going through the same thing. The treatment uses the well-established physiological model to explain things to the patient. Therapy is in a group setting rather than one to one, the idea being that the patients and share with each other. There are various established techniques being used, again with the patient being able to select what works for them. There were no significant differences between the hearing aid and non hearing aid group. The results were not too good, with only small benefits being had. This was a very open talk about effectiveness. I managed to grab Richard for a chat in the poster session and said that I was surprised that the results were not better – he was too. I had wondered whether being given too much choice the patient stops believing in the therapist, which could lead to a negative expectation and presumed failure. There is also the potential that all patients in the study were chronic and wanted a cure, being taken from the hospital waiting list with an opportunity to take part in a free trial. Magda Serada presented next on the Delphi review for recommended procedure of fitting hearing aids. I was at Magda’s other presentation so I have already discussed a part of this. The Delphi is the evidence based process of gather opinions from a lot of people to help formulate the guidance. Taking opinions from patients and professionals. Magda demonstrated how some of the elements had been rejected and others had been supported to find the most important ones for the fitting procedures, each requiring 70% consensus to advance. Maria Pedemonte presented on sound stimulation at different sleep stages in patients with tinnitus. This was research into the Levo system. The system appears to be based on playing sound that mimics tinnitus. All patients had sound stimulation in N2 sleep stage, this is the stage that is said to interact with the auditory networks. They concluded that this stage is where they can reduce tinnitus intensity. The research was presented as the first step. Not a full trial but some background data. If I’m honest I didn’t quite understand the protocol for the trial so I’m not sure how robust it was. There were questions after the presentation, from people who understood the brain. The main thrust was – if this works so well then why aren’t we all researching it? There have been many products over many years to train people during sleep, however from a search it seems that the theory isn’t necessarily proven. Hearing aids for tinnitus from a clinic in Jena was the subject of the next presentation. They showed that using a hearing aid where there is no hearing loss enriched the sound stage and seemed to help tinnitus. Interesting as there are also studies that show the opposite. Maybe we are seeing that it depends on the individual? 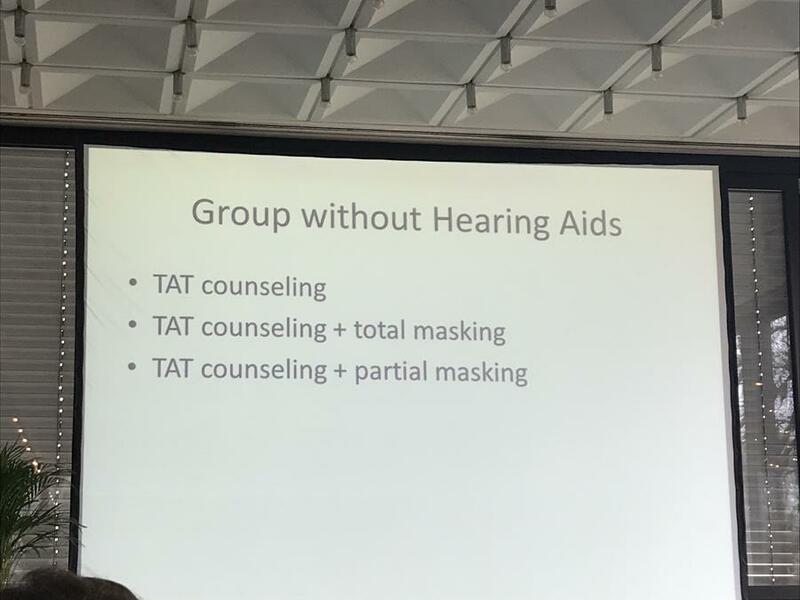 Acceptance of the hearing aid was found by their study not to be dependent on the degree of hearing loss, they recommended them for all situations, including where there is no hearing loss. I’m not too sure about this conclusion, it doesn’t fit with other research I’ve seen. Next up was a presentation on the GRM7 and NAT2 genes and the role in tinnitus. They found connections between the genes and instances of age related hearing loss. Among the comorbidities noise exposure and high frequency hearing loss were the most statistically significant, suggesting that the phenotype has a role to play. Their research showed a statistical association between the presence of GRM7 and severe tinnitus. The tendency to develop a sever grade of tinnitus is relatively high for slow acetylator phenotype of NAT2 when compared to intermediate acetylator. Deb Hall presented before lunch on the progress of the COMIT’ID study to develop the core outcome domains for tinnitus. There were questions on what else could be used once we agreed the core outcome domains, the core outcomes are the standard and then the organisers are able add other measures if they are appropriate. It was nice for us to be thanked in the presentation for facilitating the online forum. I had a chat over lunch with Kushal, one of the ESIT students. He is looking at apps for tinnitus and gathering data from apps to help us understand more about tinnitus. Kushal is probably the most polished PhD I have ever met, immaculately presented and brimming with confidence. 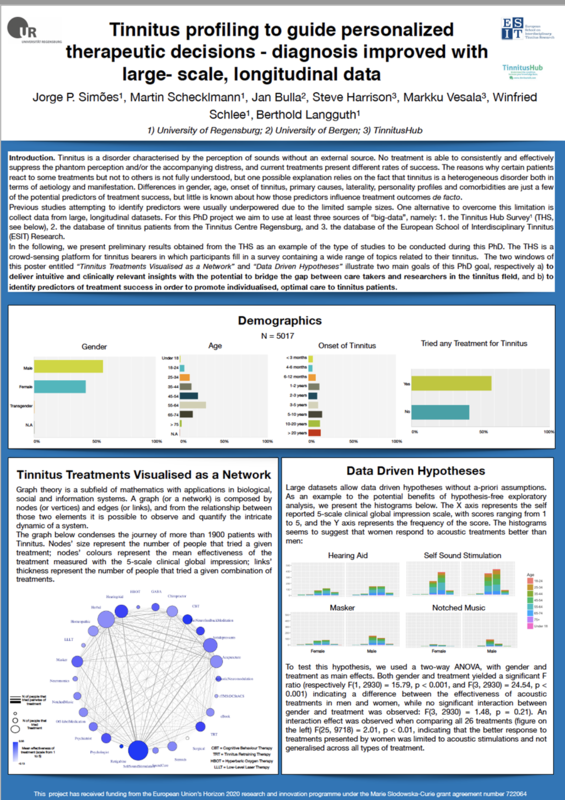 I think that there will be a few tie-ins with Tinnitus Talk and his work as it involves big data. The presentation opened with the statement that if you understand coffee, then you can understand tinnitus (for those who enjoy coffee more so). When you have a nice mug of fresh coffee, the prediction of smelling and drinking that coffee makes you feel better. Will was presenting his own framework. Is it a unifying framework, something to explain a lot of the other research out there? 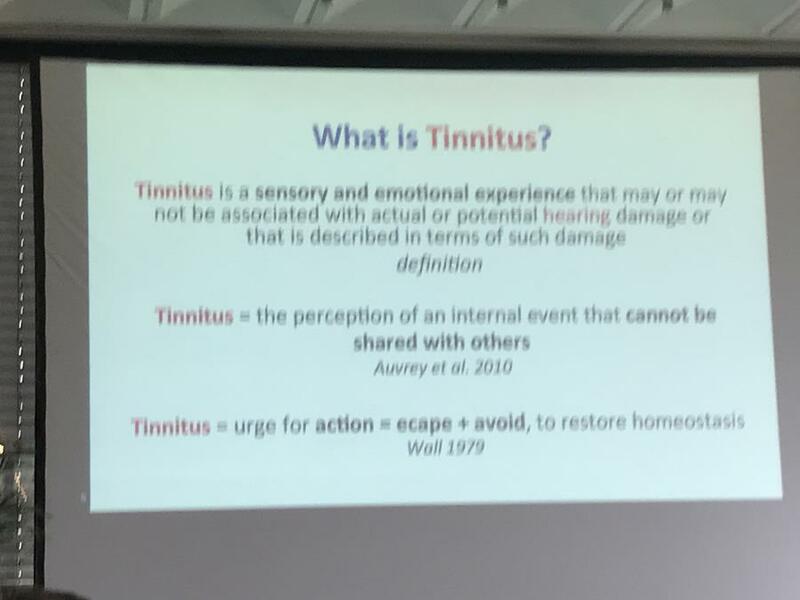 The presentation discussed various models of tinnitus, and it also discussed the paradoxes of each of the models; how can all of the models work together? I won’t go into all of the models, partly because it would take a lot of space and partly because I would need to fully absorb them to write in detail. Observations in one of their studies on brainwaves were that gamma oscillations related to a prediction error, Beta oscillations related to prediction updating, Delta Alpha oscillations related to prediction precision. From other studies alpha rhythm is dominant. Finding enhanced slow-wave, or delta, activity (<4 Hz) in awake subjects is usually a sign of a dysfunctional neuronal network. It has been observed in tinnitus patients that there is a decrease in alpha and increase in Delta. Now, I won’t pretend to understand all of the things presented here but even though I don’t get all of it, it inherently makes sense to me. When it was being explained I got it, although looking back at notes and slides it seems more abstract. The tinnitus is first heard, there is a prediction of the tinnitus noise. Then there is a subconscious amplification of the signal. In this way tinnitus becomes encoded by the brain as the new silence. Everyone’s auditory pathway has spontaneous noise, this acts as a tinnitus precursor. 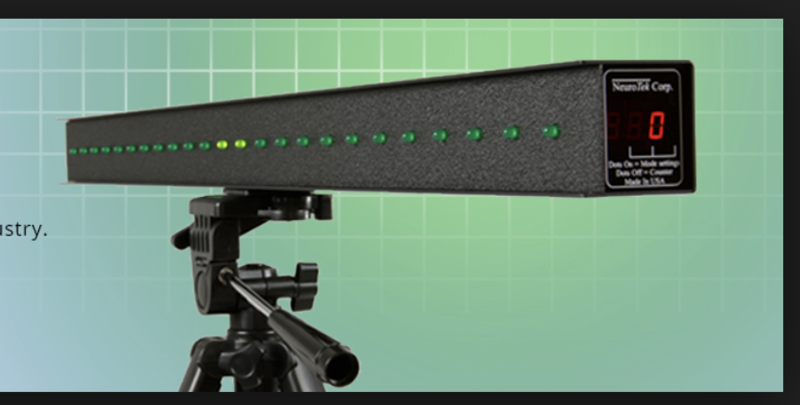 Firing rate encodes loudness but this is only part of the story, it is increased by noise induced hearing loss. Other factors predisposing to tinnitus act to increase precision – things like synchrony, map plasticity, neurochemistry, attention, psychological state. A sufficiently high precision leads to over-riding of the default prediction of silence. An embedded prediction of tinnitus leads to a continued perception of tinnitus and it becomes the new silence. This has been tested so far in chronic patients, but recruitment is underway to test this in acute patients. We will be putting out a call to UK based acute patients to visit Will. The testing is a reasonably quick process. 30 minutes to set up a 64 channel EEG, then recording for 40-60 minutes. In summary, predictions are fundamental to all perception and tinnitus is no exception. Predictions usually act to eliminate irrelevant or erroneous sensory signals but fail to do so in tinnitus. 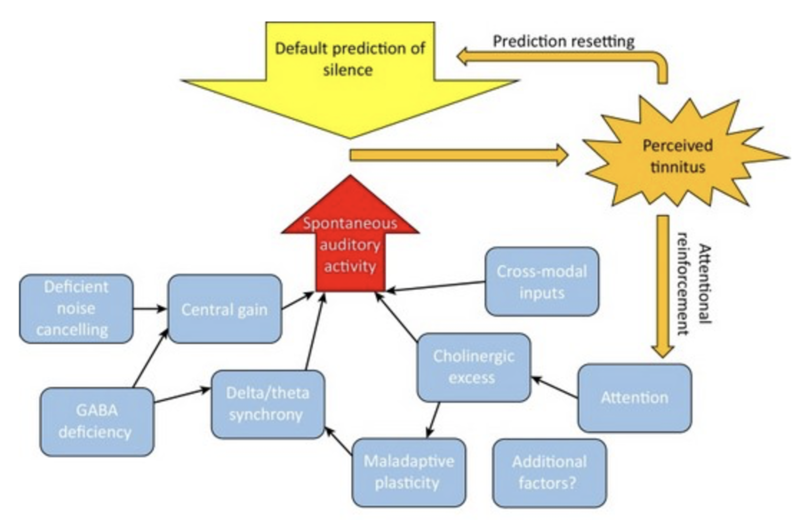 Sensory precision unifies many mechanisms proposed to underlie tinnitus. This new framework resolves the paradoxes and sets testable hypotheses and future directions for research. Will threw out a challenge for others to take up this work. He has limited resources and welcomes any collaborations. He sees the future as; refinement of the prediction based biomarker, a computational model, acoustic based interventions to reduce precision, localisation / disruption of tinnitus prediction correction and tracking of prediction / precision markers over time course of tinnitus. The afternoon session began with a talk by Grant Searchfield. Grant presented on Team New Zealand winning the America’s Cup. Although this does not at first seem directly related to tinnitus, the common factor was Matteo De Nora, he funded and got TRI off the ground and funded Team New Zealand. The New Zealand team had less than half of the budget of their USA rivals. Instead of looking to improve on what they had they went back to the drawing board and innovated. They changed their team, getting rid of some very experienced people, then came up with some very clever engineering solutions to win. It isn’t always about how much funding you have. In the words of Grant’s presentation, it’s about throwing the ball as far as we can and seeing what we can achieve. To solve a problem that confounds explanation you need free thought. I would bet that there are more than a few of the people that visit or use this forum who are capable of pushing the boundaries but don’t know how to become involved or indeed what they could achieve if they were to contribute. The first question was what do patients want? Well, this was clearly a no-brainer. I answered the question after someone else gave the same answer of cure, whether that be in 10 years or however long. I think that I captured the mood of everyone here when I said that yes, a cure but 10 years is a bit far, how about next year? I talked about patient frustration on how long trials and research take to surface. If we want to know something on Tinnitus Talk we can create a survey, send it out and have some answers in a month or less, whereas it seems to take an age for research. Grant Searchfield explained that the process of academia lay at the core of this, which I am familiar with to an extent. There is a lot of pressure to publish in peer reviewed journals. This takes a long time, sometimes years. But it is ingrained into the academic system. I feel like it holds so much back but I’m not too sure how successful we would be in campaigning to reform this. I also talked about the importance of gathering big data from patients, which is an obvious one from me. It can offer so much, I want to make sure people realise just how much they can learn from us. One of the final things was around ideas for innovating future conferences. David from the BTA spoke about involving people from different disciplines, things like engineering. I like the idea, it could work. I also spoke about having a conference as more of a space for ideas rather than having presentations. Maybe with a good structure we could develop on things we already know, and the different perspectives could help to advance knowledge. I unfortunately missed the beginning of the final keynote from Sven Vanneste, Pathophysiological Differences in Phantom Sound because of discussions after the panel. The talk looked at developing a biological model of tinnitus. Delta and Gamma activity are tinnitus predictors. Also, to a lesser extent Alpha. A slowdown of alpha stops lateral inhibition. Sven talked about the way that prediction works within the brain. I would repeat but I need more of a neuroscience understanding to get it right. The more hearing loss a patient has, the more the parahippocampus lights up. Mild hearing loss correlates to increased gamma activity in the auditory cortex. Severe hearing loss displays less auditory cortex involvement. Hearing loss without tinnitus, displays increased alpha .Delta activity seemed to be correlated with how loud you hear your tinnitus. I got to talk to one of Sven’s students, Jeff Hullfish, earlier. He presented a poster at the conference. 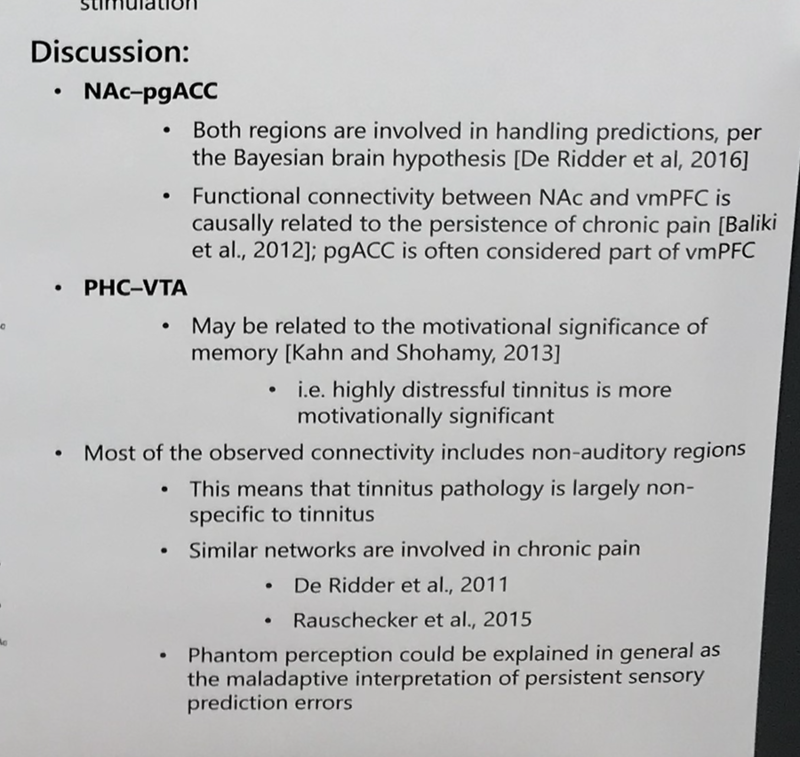 The work is waiting to be published, but it showed a potential connection in the brain between tinnitus and the area relating to the motivational significance of memory – highly distressing tinnitus is more emotionally significant. We finished off acknowledging the brilliant people at the TRI who organised the conference. They did an amazing job of coordinating an event with so many people present. Next year’s TRI conference is in Taipei in Taiwan. In the presentation they discussed the Taiwan Tinnitus Association, founded in 2012, there are more than 200 members who are ENT’s or Audiologists. Two prizes were given for the best posters of the conference. The competition here was pretty stiff, I believe there were over 100 in total. A lovely finish was that the poster most likely to influence current research went to Jorge Simoes, with his Bayesian Analysis of the data from the Tinnitus Hub survey of 2016. It feels so good that our work was the basis for this poster and really demonstrates how important it is for us to understand more from the patient group. It’s been an excellent experience, I would say my best yet. I feel like I am learning more and gaining more and more insight. Was it disruptive? In some elements yes it was, I would highlight Will Sedley’s talk in particular. In general I would say it was progressive. In some parts it felt like a comfortable pair of shoes, steady away and not causing any controversy. However, I would say that you cannot survive in your flashiest shoes alone, you need to know that the comfortable “tried and tested” pair are there as a bedrock. Ignore the lessons of the past at your peril. Some of the students I spoke to who were coming through the ranks in their PhD’s I feel have a real chance at disrupting their chosen fields. I love the enthusiasm and the will to charge forward. 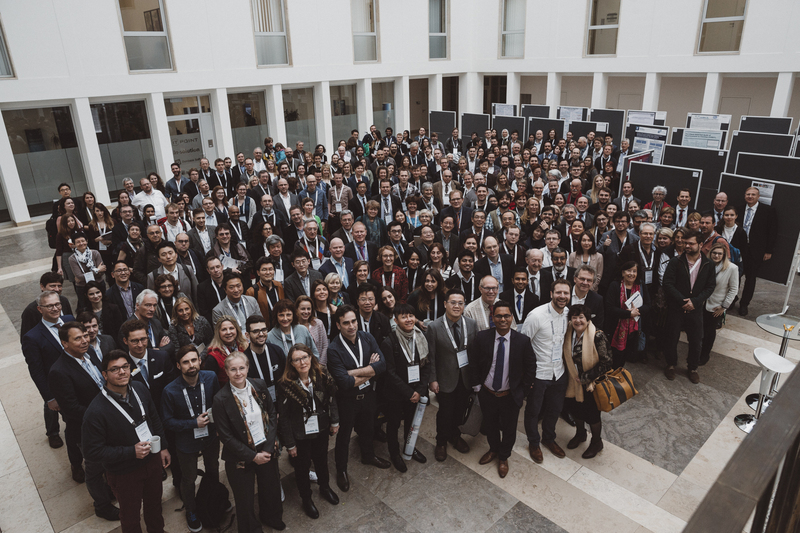 I won’t mention names because I don’t want to exclude those I didn’t hear from, but the future of tinnitus research looks bright. Of course, we all need to remember that no matter how much we want it to, research does not move at a lightning pace. There are structural reasons for this that are embedded in the funding and progression of careers. 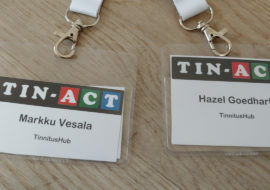 Tinnitus Hub and Tinnitus Talk have featured in a fair few areas of the conference. We should all be proud that our collective experiences and data are helping to inform research.